Some TitleAs a shop employee you are not permitted to submit a thread. This feature is blocked.You can not submit new deals. Not bad for a cheap indoor IP camera controlled by your mobile. Move it left, right up and down. Pretty much does all the basic stuff you would expect and takes a mini sd card to store images. Need to use your own usb charger as it only comes with a cable. These cams can be very good, it's just ongoing support which is why I …These cams can be very good, it's just ongoing support which is why I don't bite. It's bloody £7. What on going support do you want, once it's broken it's broken. These cams can be very good, it's just ongoing support which is why I don't bite. Can you view via an app? I know nothing about these, can you run them off a data sim? Just I face one at work and there isn't any WiFi there. I know nothing about these, can you run them off a data sim? Just I face …I know nothing about these, can you run them off a data sim? Just I face one at work and there isn't any WiFi there. Ah so a old phone might do.... I might get one to play with. Do these work with TinyCam? Do they support ONVIF and IR-Cut? Anyone know what app this uses? Currently using MIPC would prefer it to work with that? I wouldn't expose this to the internet. Almost certainly lacks security. Good on an isolated network or through a VPN if you need off site access. The app records sraight to your SD card and you can view both real time and recoded video from your android device simply connecting to your router from your sim card. The app also allows you to zoom in and out and move the cameras in any direction. Also has the ability to ring you upon detecting movement but i have never used that feature. You will need a power adapter which is basically any decent 5v phone adapter with a micro USB plug on the end. All in all a very cheap security solution. So how do you view this from outside the home? you connect you phone to your router at home via the APP..
Why is mine saying £8.37? That's exactly what I use them for, but in my case its my Motorbikes..
Its gone to £13 when i was ready to pay! What's the best app to use with this? These so called "P2P" cameras connect to a server run by the manufacturer, the app they provide connects to the same server and streams the video through it. As someone mentioned earlier these type of cameras tend not to be very secure against hacking. If it actually does support ONVIF like it claims, then it would be better to run a local VPN server eg on a router, block the cameras internet connection, so you can remote access it securely. Has anyone ordered from Gearbest via Expedited sipping Dhl EU? Just got the Tinycam Pro app at the BF sale price of £1.79. Could be useful for others to use too. Showing up as £13.29 when I click through? 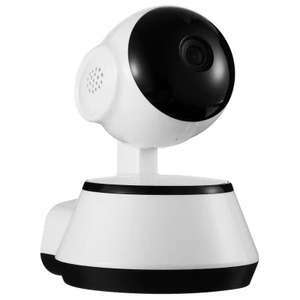 Thinking of using this as a baby monitor through phone , ive read about people saying these go through a Chinese server, all I want is to view it at home, is this something to worry about or have I mis read it. So if these sort of things are hackable, what does it mean? Is it just someone in China can see my car on my drive, or me wandering around in my pants at night, or can they access my network, stealing my identity etc? Great if you want the Chinese watching you! So if these sort of things are hackable, what does it mean? Is it just …So if these sort of things are hackable, what does it mean? Is it just someone in China can see my car on my drive, or me wandering around in my pants at night, or can they access my network, stealing my identity etc? Can't comment on this model, but unless you prevent them connecting to the internet, in general you should assume that anyone with an internet connection could view and operate your camera, listen in via its microphone, swear at anyone in the room, and might even be able to install a bot on it, or obtain any data stored in its settings which might include your wifi password and email password if you've configured them. I have my router configured to block internet access for my cameras, outbound (to stop P2P working) and inbound. Only one of my cams can have p2p access turned on or off in its settings. All the cameras I have support Onvif so I can use any onvif or rtsp viewing app (the P2P app on one of mine will still also work as it will connect directly to the camera if they are on the same lan, which is just as well as its onvif support is buggy ) and I mostly monitor them locally, but if I need to access them remotely, I use openvpn running on an a router, which gives me secure encrypted access to everything on my lan. Via gb app for myself showing £7.63 but once i go to payment page goes up to £13, anyone know what I'm doing wrong :BTW postage choice is free! These so called "P2P" cameras connect to a server run by the manufacturer, …These so called "P2P" cameras connect to a server run by the manufacturer, the app they provide connects to the same server and streams the video through it.As someone mentioned earlier these type of cameras tend not to be very secure against hacking.If it actually does support ONVIF like it claims, then it would be better to run a local VPN server eg on a router, block the cameras internet connection, so you can remote access it securely. Can you detail more? Baby steps as I'm a noob at this. I just want to access camera from work. hotukdeals is a community for deal seekers. Find and share the best deals, promotional codes and vouchers from on and off the web.